One problem with learning badges is a learner might collect hundreds, thousands of them through education and higher education. I am developing a Skills Emblem, which is essentially one learning badge for each skill you work on. 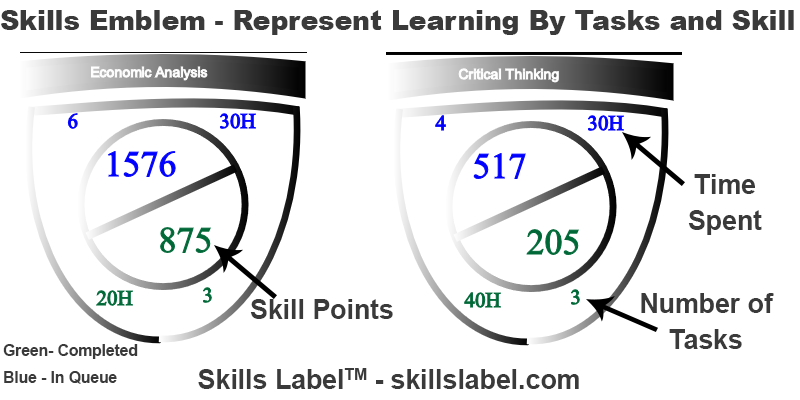 Perhaps, a learner works on forty skills (so forty emblems) during this period. As a learner completes tasks (and progresses through their education), the information is updated automatically. Skills Emblems are dynamic learning badges. One problem with verifying learning is so much learning takes place outside of the classroom. Skills Labels help bridge all learning expectations, such as self-guided and required learning. A Skills Emblem is a great way to present and validate learning. The designation between queued and completed work is useful by signaling to a learner and their audience how learning tasks are impacting their growth each step of the way. All the data updates automatically as a learner consumes learning resources (represented as Skills Labels). At this stage, they are part of the Skills Label platform. In future iterations, these skill emblems will be accessible across platforms – like in social media, LMS systems, personal websites or portfolios, etc. The information is meant to be used throughout education and career stages. Now, it is possible to work on and track the development of a skill like Critical Thinking throughout stages and across disciplines. Critical thinking is the benchmark of college education. So, a student might get credit for doing tasks in a humanities, economics, and statistics course (and so on). A skill emblem represents a competency for a single skill, so a learner has many of them – one for each skill in their skill set. Useful for a learner navigating through a career. It becomes like a lifelong record of learning. A learner might evolve into other skills, but can always go back and access previous progress. Skills Emblem is currently one aspect of a Skills Page, which is part of Skills Label application. This Skills Page will have other functionality, including a table to track, sort, and filter learning tasks over time (based on the consumption of Skills Labels). (This is still in the works.) Moreover, big differentiation, students and young professionals will be able to access standards and method and applications they have learned. If you create learning resources, start creating Skills Labels for each of them; the resource is currently free!